Your bathroom fan is an effective weapon against the growth of mold and mildew—but only if you run it long enough after every shower. Make the change to this smart switch to be sure that you're giving your fan the time to do its job properly. At best, the bathroom serves as a sanctuary, a respite from the pressing concerns of the day. At worst, it can be a breeding ground for a host of house problems. The culprit? Moisture. Tubs and showers, toilets and sinks—those fixtures that make the bathroom a bathroom—share one thing in common. They all generate humidity. So long as it’s controlled, humidity isn’t a problem. 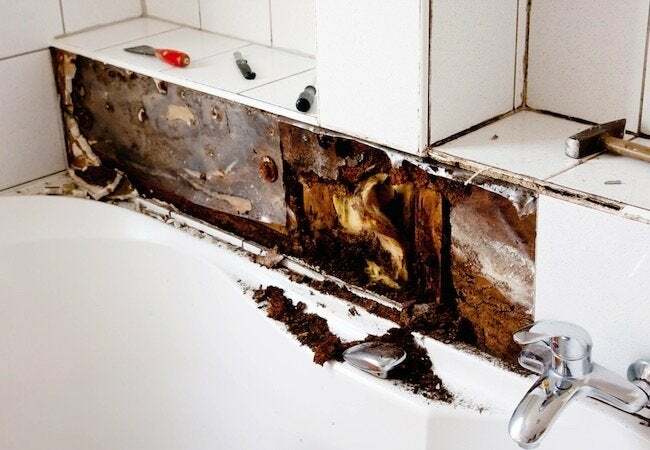 But if there’s insufficient ventilation in the bathroom, humidity can build to the point of causing significant damage in the form of mold and mildew. Indeed, excessive humidity poses the number one threat to bathroom walls, ceilings, floors, and fixtures. Poor ventilation puts your health at risk too. For instance, mold and mildew can be an irritant, particularly for those with allergies. Meanwhile, some cleaning, beauty, and hair products discharge chemicals that, without a way to escape the space, compromise its air quality, endangering anyone who enters. To prevent such problems, building codes typically call for the bathroom to be equipped with a ventilation fan. As it pulls air out of the bathroom, the fan eliminates steam and humidity (as well as foul odors). Easy, right? Theoretically, yes—but user error severely limits the effectiveness of even the most powerful fan. In other words, when a homeowner turns off the ventilation too soon, before the fan can finish its job, then preventable moisture-related problems become possible, if not inevitable. If you’re concerned about the damaging effects of humidity in your bathroom, there are at least two things you can do. 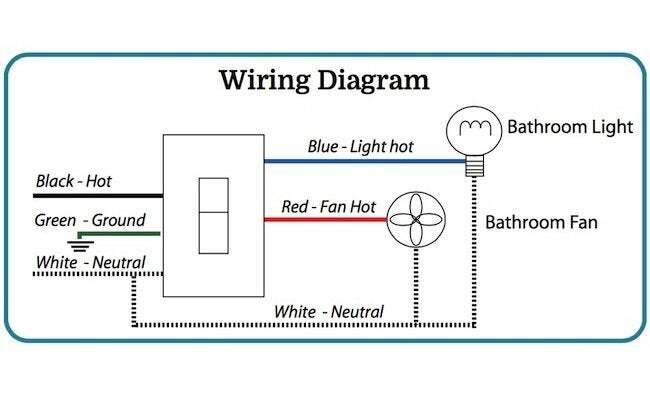 You might try remembering how critically important it is for the fan to operate during each and every shower, and for at least 15 minutes afterward. Or, if you already have enough to worry about, you can install a SmartExhaust™ and get on with your life, knowing the control system continues ventilating for precisely as long as necessary. That way, instead of wasting untold energy dollars by letting the fan run on and on, you pay only for the electricity needed to protect your home and yourself. SmartExhaust™ is a set-it-and-forget-it solution designed to counteract the simple reality that, according to Carly Maltais of AirCycler®, “most homeowners do not run the fan as much as needed.” Of course, it’s unintentional. Many homeowners simply do not understand or care to think about the hazards of humidity and the problem-preventing role that ventilation plays. Practical issues may also factor into the equation. Maltais says, “the bathroom exhaust fan should run until there is no longer fog on the mirror or noticeable moisture on the walls and fixtures.” By that time, average homeowners may already have sped out the door on their way to work. 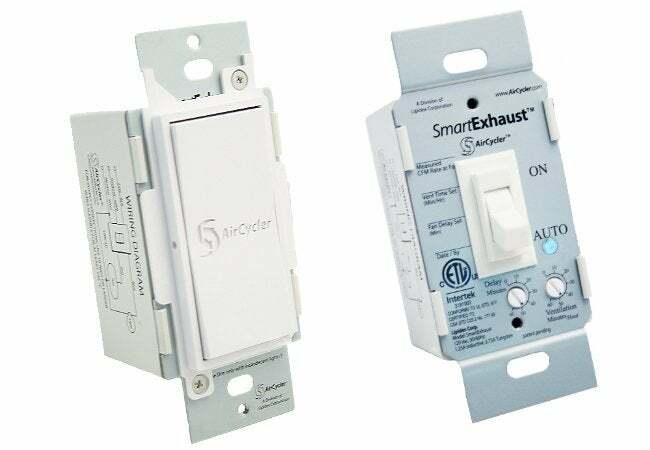 Either way, SmartExhaust™ takes over for you, setting the fan on a timer so that it runs for the appropriate amount of time, every time, without your having to remember to manually set the device. In fact, with SmartExhaust™, the homeowner never has to think about bathroom moisture again. Problems solved. Installing the SmartExhaust™ control system takes zero remodeling; it’s a straightforward process, easily handled by a licensed electrician or an experienced do-it-yourselfer. As most bathrooms already have ventilation, SmartExhaust™ simply replaces the existing fan switch. If a switch in your bathroom controls not only the fan, but also the lighting, SmartExhaust™ can easily take its place and assume control of both functions. It’s a clear-cut upgrade, not a complex electrical job. The most difficult aspect of installation may be deciding whether you want a toggle- or rocker-style switch. While the former costs a bit less, the latter offers more features and provides a sleek, seamless look. The last step is to select, from the variety offered, the switch color that best complements or integrates with your bathroom style. After that, let SmartExhaust™ do all the work of taking care of your bathroom, so you don’t have to.